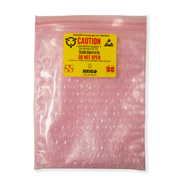 These Seco Pack 88 10" x 12" anti-static bubble bags feature two layers of anti static dissapative bubble cushioning with a zip locking top to secure electronics for packaging and shipping. 10" x 12" ESD zip locking bubble bags can reduce a 5000 volt charge to under 500 volts in less than two seconds. Additionally, the 10in. x 12in. anit static zip locking bubble wrap bags inner cellular cushioning absorbs shocks and dampens vibrations that can damage sensitive components. The Seco Pack 88 is made of multi-wall construction and has a double track zip closure. These 10" x 12" anti-static zip locking ESD cushion bags meet or exceed EIA 541 standards and are Polycarbonate compatible.